If by reading this you feel that conventions are busy, stressful and manic, then you wouldn’t be far wrong. However it is completely up to you how you approach them. If like me, you want to meet everyone there and talk to as any people as possible, then you can sometimes lose the joys of spontaneity that are the best parts of these gatherings. 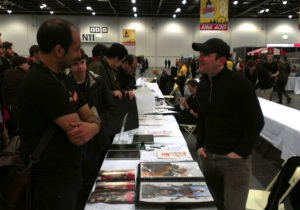 I remember when I first went to the London Super Comic Con on a Sunday, I had no idea that artists even did sketches! I was just looking around and talking to creators and I had a great time, without obsessing over who to meet and when. As time went on I decided that I wanted to invest more in art and also to interview people for my blog. And now, as I read more than ever, and write as much as I can, I find it all a little overwhelming. As good as getting signatures and sketches is, by far the most rewarding part of conventions is having interesting conversations with writers and artists and spending time with new found friends. As I ready my first ever cosplay outfit, I present to you the definitive guide to enjoying oneself at a comic convention. Pick your favourites – Unfortunately it is nigh on impossible to just rock up to a popular artist/writer’s desk and obtain a signature or a sketch. There are queues, and if you were at Thought Bubble last year, they can be quite extensive and even be capped off. This can be quite frustrating so make sure you check out who is there and of the popular DC and Marvel creators, choose which you want to meet the most and head straight there. Timing – There are often early bird entrances that cost a little more. This is to get the jump on commission lists and buy those artist pages. It is often worth going to both days but the Saturday is often the most productive. This is often because people are partying late into the night on the first day! Artists – Some artists have a list of sketches they plan on doing so unless you get there early it is unlikely you will get on them. Some people open these lists on their blogs and will have work prepared for you before you even get there. This makes life a lot easier! The queues can be slow as some artists will sketch there and then taking 10-15 minutes per person. Writers – As they do not have to draw for you, they often have queues that move faster. This means you can take the risk and meet them later in the day. There are often sessions where an hour is given to people for signing at a particular area. These are often the easiest opportunities and many will stay past their allotted time. Signing – As we all choose the books we want signing, there are a few people that will have every single comic of a run to get signed. It is your prerogative but the time it takes can frustrate others, especially when time is limited. I choose the first/last/latest issues of their work to sign but that is my own preference. People will often ask for a name for the signature to be addressed to, there are occasions where people opt out because they are immediately going to put that particular piece on eBay. 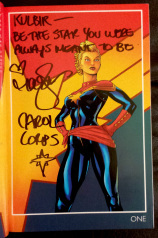 I have Kelly Sue DeConnick maintain exemplary professionalism with a gentleman who had five issues of the same book for her to just sign. 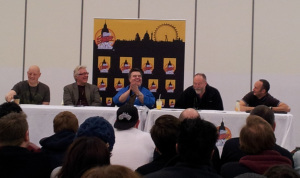 Panels – There are a number of special presentations of certain themes that may of interest. These revolve around comic companies, creator groups, sets of heroes and special events. It can also be a welcome break from hours of standing. I find certain sessions of interest but I prefer to not let it get in the way of my obsessive creator stalking! Money – Be aware that cash machines around conventions rapidly empty, and if often have very long queues. It is very important to have a budget because rapidly you can spend a huge amount of money on sketches, original pages, prints, special edition comics, rare books and collectable figures/models. I normally say that a sketch should cost no more than £20-30, which they rarely do but it depends on the time devoted and quality of the artwork. Original pages can easily be three figures and can single handedly wipe out your budget. Paper & pen – some artists do not provide paper for sketches and require your sketchbook or pads. It is certainly worth investing money in good quality drawing paper. Always have a pen with you in times of opportunity, like bumping into creators walking around such as Paul Cornell, who wasn’t even listed to appear. Food and water – There are some stalls/shops around most cons but it is worthwhile bringing your own food or snacks. The days can be quite long and tiring, so ensure you have something to drink. Your comics to be signed! Choose books that are important to you and make sure you tell them why they are so. There are numerous approaches to this dependent on your personality. There are people that will say nothing at all because they are shy or nervous, or those that are far too intrusive. The easiest way is to just start straightforward by saying hello and thanking them for their work. After all they are part of the reason why you love comics so much. This means that even if they are quiet, it is still comfortable. There will be times where you receive very little dialogue from them, no matter if you talk to them. This can be disappointing and a little upsetting but it is a relatively rare event. 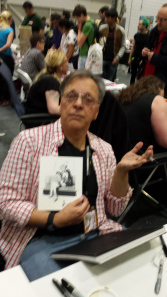 On the opposite side you have people like Howard Chaykin that rejoice in entertaining the crowd and asks people to crowd around him. It is clearly quite a long day and dull at times for artists so it is refreshing for them to talk to you. 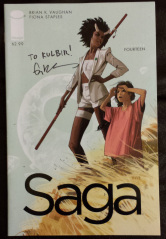 People like Kieron Gillen and Matt Fraction ask your opinions, so it is worthwhile telling them what you love. I often have a question or a comment to everyone I meet which spawns into long and interesting conversations, though sometimes it falls completely flat. There are so many artists just waiting to talk to you about their work, and trying to gauge interest. You don’t have to speak to them all but have a listen and a look, it may not be of your liking, but it is great for them to showcase their work. Everyone has to start somewhere and you never know which gems you might come across. I have never taken any friends of mine to a convention because, quite frankly, there is only one of them who is interested enough. I am now doing a group cosplay with people from around the country, and I cannot wait to spend the weekend with them. It is often a good idea to find out what people have planned and what exciting things are happening that you may not have thought of. As with a lot of life, the more you put in, the more you get out. 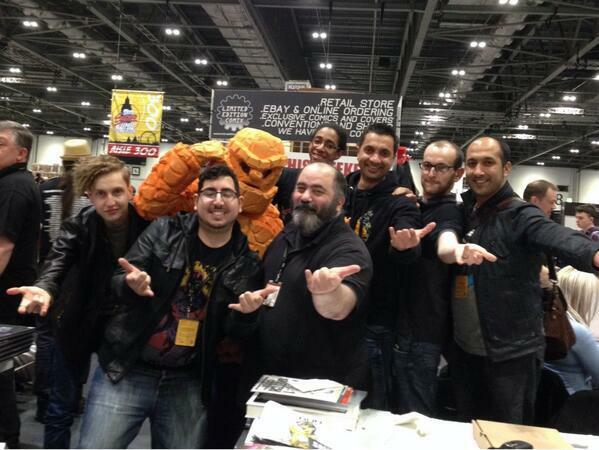 I will also once again remind people of the fantastic photo opportunity I have had with Dan Slott, thanks to my group of friends who go by the name, Horizon Labs. Above all else make sure you have fun and soak up the atmosphere around you because it is rare to be with so many people who love the same things you do. Be organised to a point but make sure you grab those opportunities when they arise, be it being randomly second in the queue for a free Sean Murphy sketch or having a cigarette with David Aja. I write a regular review of the conventions I have attended and it is an opportunity for me to showcase what I have found, but most importantly it is a means for communicating the time I have shared with writers, artists and friends. And above all else make sure you look me up at the next convention you visit! Great advice! I went to my first comic con last year and was completely lost. Wish I had read this before hand. Thanks for the positive words! Cons are crazy places at times, its like trying to get into comics on day one! Agreed! I just started getting back into comics a year and a half ago. I love it now though. 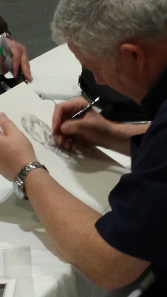 Who is your favorite artist/writer you’ve met at a con? Oooh! You should read my con reports. Favourite artist is Howard Chaykin without a doubt, and writer is probably Matt Kindt! That’s awesome! I’ve only been to one comic con in Indiana but my favorite artist I met was George Perez, and favorite writer would be Tony Bedard. I will have to check out your con reports! I put a lot of detail in them and focus a lot on the creators! George Perez is a lovely gentleman! Im going to indiana comic con again next week, I reread this article to make sure I was ready! Thats awesome! When I first went there was so much I wish someone had told me!